I just wanted to let you know that THIS is one of the major reasons that I finally got around to trying out this pattern. 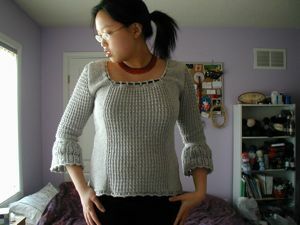 I was going to substitute another yarn, maybe Cascade Fixation or Elann’s substitute, but then the Elena went on sale CHEAP, so I went with it. 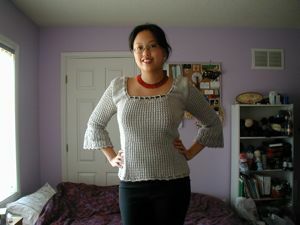 I love it so far, but I sewed one sleeve in and I’m starting to understand why you threaded a ribbon through it. 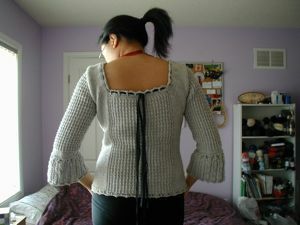 The weight of the sleeve is trying to pull the whole sweater off my shoulder! Hmmm. Maybe some hidden elastic sewn on the inside up and over the shoulder? 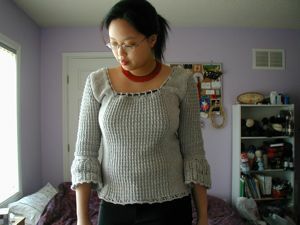 I might take out the sleeve and rework the tops of the main pieces without that last little bit of short row shaping. I wonder if it would have done this if I’d used the Fixation? I love the ribbon option, too. It adds a nice touch to the sweater. I can’t wait to finish, now. Thanks for the inspiration! In the picture, it is so baggy but yours looks nicely shaped. Oh- and I love your Serrano and Lucy in the Sky patterns. They are definitely on my to-knit list!